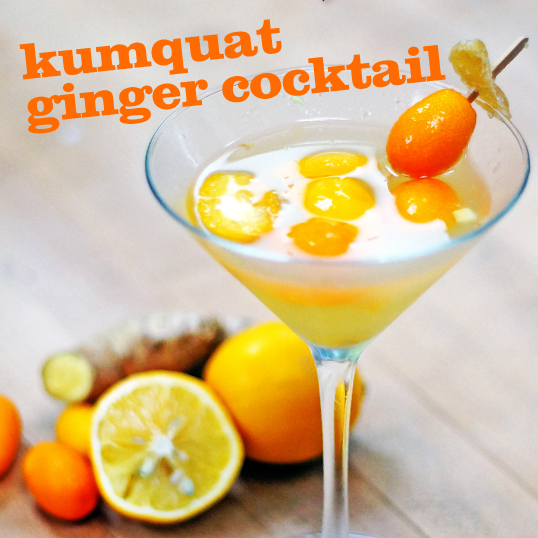 In old fashioned glass, muddle Meyer lemon, kumquats, and minced ginger. In cocktail shaker with ice, add Meyer lemon juice, vodka, Triple Sec, and ginger simple syrup. Shake well and pour over muddled fruit. Garnish with whole kumquat and piece of crystallized ginger on toothpick. Additional serving suggestions: Strain cocktail into chilled martini glass, or pour over ice and top with club soda. Ginger Simple Syrup: Add 1 cup sugar and 1 cup water to small saucepan. Over medium-high heat, bring to a boil, stirring until sugar is dissolved. Peel one piece (about 10 inches long) of fresh ginger, and slice into thin rounds. Add ginger to boiling syrup and bring to a simmer. Remove from heat to steep about 30 minutes. Strain syrup into an airtight container and refrigerate. It will keep about one month. Internet Explorer users may not be able to view this video.